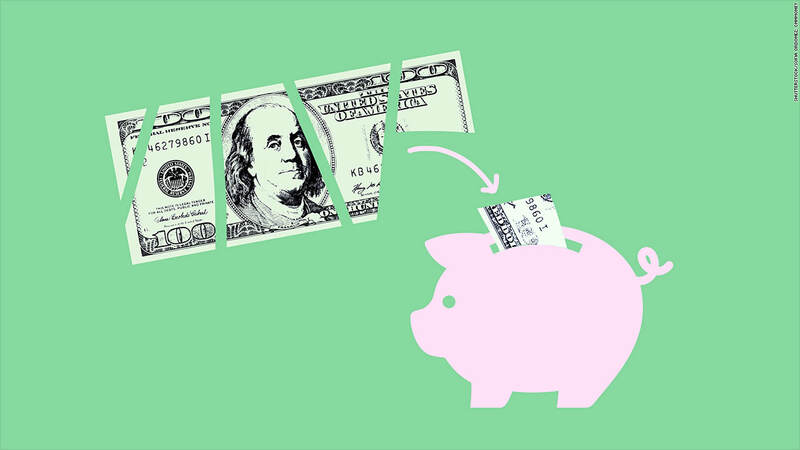 To the average American, saving money is a mythical topic. In a recent CareerBuilder report, 78% percent of full-time workers said they live paycheck to paycheck, up from 75% in 2016. Retirement savings can seem unnecessary when you're barely getting by. That said, you and your spouse will need about $1 million to live comfortably during your golden years, and waiting for a financial windfall isn't the best use of your time. Take these steps to prioritize savings with the resources you have. It's not easy or fun, but cutting unnecessary spending is the most effective way to take control of your finances. The good news: According to a study by Hloom, 8 out of 10 Americans admit to wasting money, so there's a decent chance that you're not as broke as you feel. Start small by eliminating things that aren't overly painful, and work your way up to making significant cuts across the board. An efficient budget will help you form better savings habits. The opportunity to save money is vast if you know where to look. For example, suppose you have a $5,000 credit card balance with a 22% interest rate. If your credit score is decent, your bank may be willing to lower the rate, which will help you repay the debt more quickly. This is just one example of how a frugal mindset can change your lifestyle, and you'll be surprised by how easy it is to negotiate savings. For instance, while you probably wouldn't think to haggle at big box stores like Home Depot, most are willing to price match their competitors. The same goes for internet and phone providers, office supply stores, baby stores, and even online retailers like Amazon. Prioritize savings by finding discounts in every corner of your budget. The idea of working after work probably sounds awful, but there are plenty of ways to earn extra income without feeling burnt out. If you're a homeowner, consider renting out a room on the weekends via Airbnb or another rental site. If you're artistic, use your talents to sell goods through Etsy. Or, if your day job skills are in high demand, consider selling yourself as a part-time consultant who commands a high fee. There are 44 million people working side gigs in the U.S. alone, and even modest savings can add up. For example, at a 7% return, investing $500 a month will yield nearly $592,000 in 30 years. Take stock of your passions and financial goals to find the perfect fit. One of the biggest roadblocks to retirement savings is lingering debt. Whether you're paying off student loans, credit cards, an auto loan, or a mortgage, controlling your cash means making deliberate choices. For example, paying off credit balances with variable, high interest is usually the best choice. That said, it might not make sense to make accelerated payments on fixed loans with low interest, especially if it prevents you from investing in retirement. Review your finances and strike a balance between long-term savings and immediate expenses. Saving for retirement is easier with the support of your employer, but the sad truth is that only about one-third of Americans are taking advantage of their 401(k)s or other tax-deferred retirement plans. If you haven't already, redirect your savings as soon as possible, and be sure to ask whether your company matches a portion of your contributions. There's nothing quite as satisfying as free money, and your employer's 401(k) matching offer is exactly what you need to supercharge your efforts. While you're at it, don't forget to learn about the other ways your employer can help you save money. If your company offers a health savings account (HSA), your out-of-pocket medical expenses are tax-free, which frees up a portion of your income to save for retirement. The same goes for flexible spending, which can include expenses like child care, home improvement supplies, and more. There are ways to save for retirement even if you don't have access to an employer-sponsored plan. The value of compound interest means that your money has the power to grow until the day you retire, and it's important to take advantage of the time you have between now and then. Consider opening an individual retirement account (IRA), which allows you to contribute up to $5,500 a year or $6,500 a year if you're over age 50.